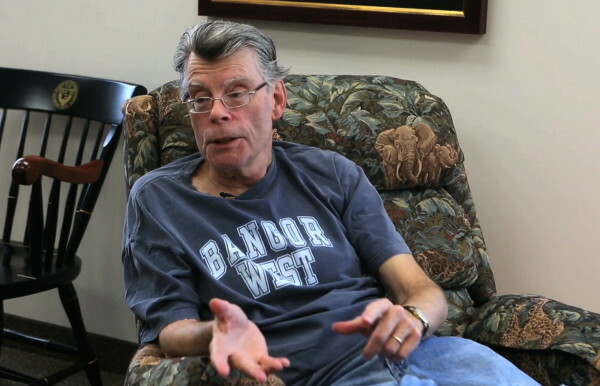 Stephen King talks with BDN's John Holyoke Thursday, October 2, 2014 at his office in Bangor. ORONO, Maine — The University of Maine announced Tuesday it will establish a new endowed professorship in honor of its most famous alumnus — horror author Stephen King. The Stephen E. King Chair in Literature, funded through a $1 million grant from the Harold Alfond Foundation, will support a faculty post in the university’s English department. A search to fill the new position is expected this fall. King graduated from UMaine in 1970 with an English degree. Three years later, he published his first novel, “Carrie.” Since then, he’s written 54 novels, six nonfiction books and nearly 200 short stories. In November 2015, King was awarded a National Medal of Arts, recognizing his contributions to literature. “Needless to say, I’m delighted and a little awestruck. It’s my alma mater, after all, and this is a high honor,” King said in an email. UMaine hopes the newly endowed professorship will allow it to recruit an accomplished “teacher and a scholar of literature,” according to College of Liberal Arts and Sciences Dean Emily Haddad. She said the position would help the English department expand its role and influence in literature, creative writing and the humanities. An event celebrating the new post will be planned later this year, according to the university.